Amaji lived in a village (6-7 houses) at a place called Shaminala about 5km from Manali and 2km short of the bigger village of Jagatsukh on the west bank of the Beas. This road winds along the river, and the entire mountainslope has apple orchards everywhere with terrace fields for crops in more even areas. Red [brown] rice in summers along with vegetables for consumption and the outstanding local rajma; wheat [sometimes barley] in winters. A simple four room construction. Two on top of two, not interconnected, all facing same way, built on the slope of the mountain. When I lived there, the top floor had just been built, and the wooden balcony had no railings. We used to spend days sitting on it, doing something or the other, listening to songs as we spun wool, repaired saddlery, or did any of the many things one ends up doing in a rural home. Surrounded by apple orchards and scent of apples on the breeze. Endless cups of tea or chang, depending on occasion. No running water, no permanent toilets. The water supply was a pipe stuck into a natural stream higher up in the mountain and brought into a stone slab. 24 hour running water meant exactly that – 24 hour RUNNING water – no tap. It was just a small part of the stream diverted through the stone slab clearing, flowing year round. Water ferried home in jerry cans for cooking and drinking. My thin chapatis were a superhit and always desired. Only that the family was the parents, five brothers, two sisters, my then boyfriend, me, and anyone else who happened to be visiting. All robust folks with massive appetites. Making over hundred chapatis for one meal in addition to rice was routine. Me, I loved rajma chawal with the local rajma – or potatoes from Sethan with anything. Lost count of the nights spent sleeping in sleeping bags on that balcony, staring at the sky, waking up to bright sunlight and amazing views of the valley. Possibly the first time in my life I could just BE without cares, without feeling judged, without stress, strains, pressures. Perfectly accepted for what I was, my contributions perfectly welcome whatever they were. I have no photos of this place, and now it is much changed too, but Here’s a song that I will forever associate with that balcony, its amazing views and feeling of being one with the world and perfectly ok. Amaji is the undisputed lifeline of the home. Strong, courageous woman, she was the one to work with the horses when her husband’s frail health limited what he could do, and the children were too young to help. 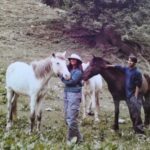 Remember the nomadic migration with horses I wrote about? Her second youngest son was born on the road, behind a cowshed during a migration. She worked the winters, loaded firewood expertly (one of the most difficult loads for putting on a horse) … When I met her, she was sixty, and could heave a sack of potatoes on her back and walk off while I collected my jaw from the floor. But that capacity also comes with tremendous caring. You could speak with her about anything and get straight talk. She might even give you some very orthodox advice, but it was always her opinion, never an imposition. One of the most amazingly mature people I have ever met in my life. Though she did have a fiery temper 😀 The home is about a hundred meter climb from the main road. Now, they have built another home slightly below the original one, I hear. With so many of the sons marrying, space was needed 😀 When I lived there, there was only Sonia – Achoo Lalsingh’s daughter. Now they all have kids, except the youngest – Bhimsen, I think. I hear they keep “abi” [grandmother] very busy. This was my first feeling of being home. Adopted among strangers, loved unhesitatingly as one of their own.